Signature Iron Doors crafts an extensive selection of iron designs. 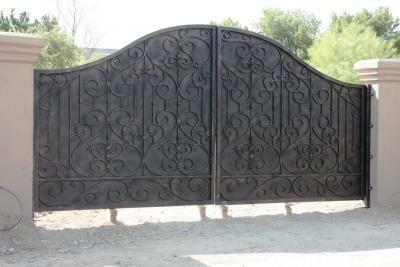 This is a solid Milan style gate done for a client near Cave Creek Arizona. Our iron is hand forged and all doors are built to match your home and style. We guarantee a gate that is timeless in security and beauty. Call us and come visit our showroom in Phoenix Arizona to discover why a Signature Iron Gate is leading the market and we can benefit you.